Welcome to this new weekly blog of March 16, 2019 in which we talk about any progress or issue that is being discussed about Stakinglab where we can see the great things that are being achieved, this section of blogs have been created so that all the people who work with our platform are informed that Stakinglab works every day to bring you the best service. This time we are going to talk about great news and is that recently a large marketing group has decided to talk about our platform which has made a great article for many of its readers which has caused a lot of stir and boom in our platform so let's talk a little about what's about so that you know primarily. TheCoinRepublic is a large marketing group that makes articles to the biggest news of the moment on cryptocurrencies and blockchain technology. This company has a large number of people working every day to bring their great readers that in fact you can calculate between your percentage of readers and followers of instagram, twitter, facebook who are around among the 18,000 active users can see how big this is, this company has settled in London, United Kingdom the main focus of this company is that it is a leading Bitcoin news provider , blockchain, cryptocurrency and altcoin News which aims to provide its readers with the latest news and updates from Cryptocurrency. A comprehensive solution to obtain information and news related to the cryptocurrency. TCR is the republic for the coins. 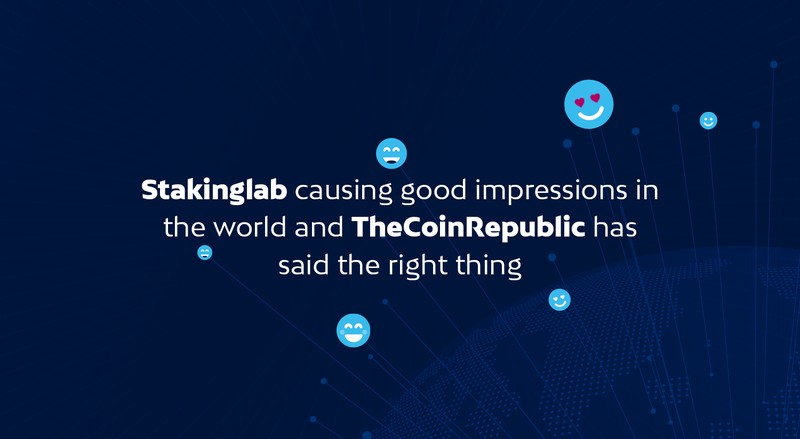 Why is Stakinglab the best platform for staking pools and shared masternodes according to TheCoinRepublic? At the beginning of the publication there has been a good introduction to our platform that is what we offer, where we are from and what is our main focus to give to the public. They did a thorough investigation on this and gave the following results. Given the great acceptance of the world in the mining of proof of stake and masternodes, every day more and more people join this wonderful world since ecology is our main protagonist in this and that there was a great roll which needed to be focused and is the community in general, why is this? Stakinglab focused on all those people who do not have sufficient technical capacity to host masternodes and configure those things that become dicile but in which they want to invest in this since they know that it is an excellent way to generate passive income in addition to that also focus on those people who really want to invest in this and do not have enough money to buy the maximum needed collateral in the case of masternodes or if not many of these investors want to expand their portfolio and invest in different currencies, As I said basically, our focus is always the community. The excellent thing about this publication is the way it was written as it was done in the form of questions and answers, something very precise to give the information that you want to transmit, now they say that we are the best platform since we have a great experienced team and if so, because we have the greatest experts and people committed to working tirelessly every day to offer the best service. We are informing you that we have the best IT infrastructure of its kind since we are focused on the best service and we invest in the best technology so that the wallets, nodes, etc are always connected without any fault so that we can work in the best way for the public. They mention something very relevant and that is that we have a large number of people in our community that customer orientation and respect for an individual policy help our community grow very consistently. In addition to Stakinglab has something very interesting and this is, it has the largest and most real reference system in the market because they say real why? because it is a number considerably very beneficial for you to obtain 20% of the generated by that person in our platform for each reference. Undoubtedly a great publication by this great marketing company as you can realize Stakinglab focuses every day on providing the best services as well as the best associations with large companies that recognize that we are doing things right. Thank you for reading this publication and what do you think of this great publication by this great marketing company? I'll leave the link so you can have a look at the publication of this company until the next post.